In my never ending quest for new snack options for my boys, I have tried some strange combinations. It can be so hard to find something they like that is not loaded with sugar or additives. Making my own snacks can be a good option but I don’t always have the time for complicated recipes. 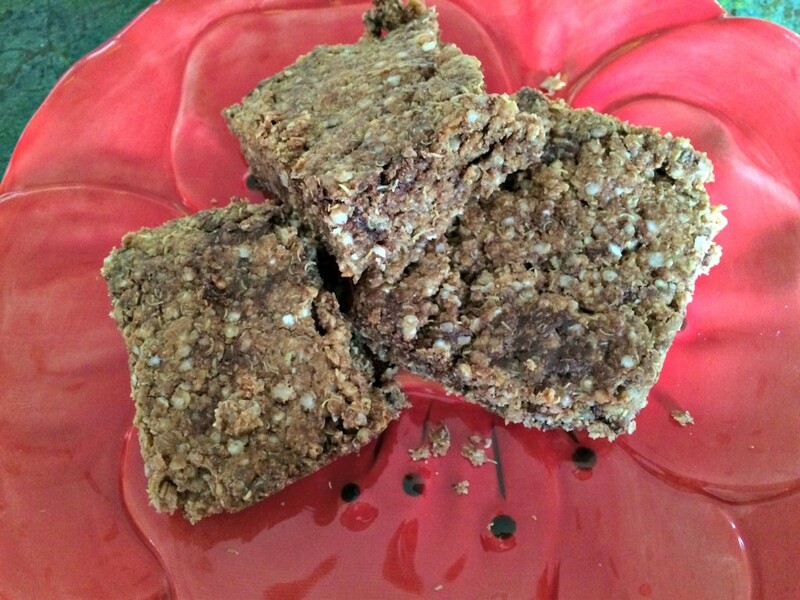 I was so happy when I saw this recipe for Quinoa Bars from My Whole Foods Life . It was easy and had very few but yummy ingredients. I love quinoa- every cup has 8 grams of protein, 5 grams of fiber and is a good source of manganese, magnesium, folate, phosphorous and B vitamins. It is a gluten free seed with some serious nutrition! I had never tried quinoa flakes before so was curious to see what they were like. I bought Ancient Harvest Quinoa Flakes . They were so nutty and yummy that I used them again this am in some chia seed pudding. I could see a lot of uses for them! I wanted to make a few tweaks to the recipe but pretty much left it as it was designed. I decided to add some chocolate chips to these bars to entice my boys to eat them. I really like Enjoy Life Semi-Sweet Chocolate Chips because they taste like regular chocolate chips but are gluten, soy and dairy free- so yummy! Finally, I had a weird assortment of nut butters that I cobbled together because I didn’t have much of any particular type. I used Mara Natha All Natural Roasted Almond Butter, Maranatha Cashew Butter and a tiny bit of a local pumpkin seed butter. The recipe from My Whole Foods Life was for raw bars but I wanted to try to bake them to see if I could get them to hold together better. (I often find my raw bars tend to be crumbly.) I wasn’t sure if it would help but decided to give it a shot. Place quinoa flakes in bowl with cinnamon, and salt. Heat nut butters, syrup, coconut oil and vanilla over low fire until well combined. Add chocolate chips. They will melt if you don't allow the dough to cool. I like them melted so didn't cool the dough. Spread dough in 8X8 parchment lined pan. Press down firmly to compress the dough. Place in oven for 20-25 minutes depending on your oven. I am always looking for both new healthy snacks with staying power (especially for my husband) that aren’t loaded with sugar and new ways to use my quinoa flakes. Think I just found a new favorite snack. Thank you Teri! Hope you and your husband enjoy them! I made these yesterday and we both love them. I did substitute half of the quinoa flakes with almond flour because I like the flavor from that combination, but these will definitely stay on my snack list. Those look great- must try! Oh these sound and look so delicious! As soon as I can have quinoa again (if I can again… it’s one of the foods on my Do Not Eat list right now), I hope to try this recipe! And the Enjoy Life chocolate chips and chocolate chunks are my FAVORITE! I only bake with that brand now. Hopefully, you can figure out if quinoa is right for you. I was thinking about trying this with amaranth flakes too so maybe that would be another option. Good luck! These look like a perfect and delicious treat! I’m working on making treats that are healthier for me and this seems right up that alley! 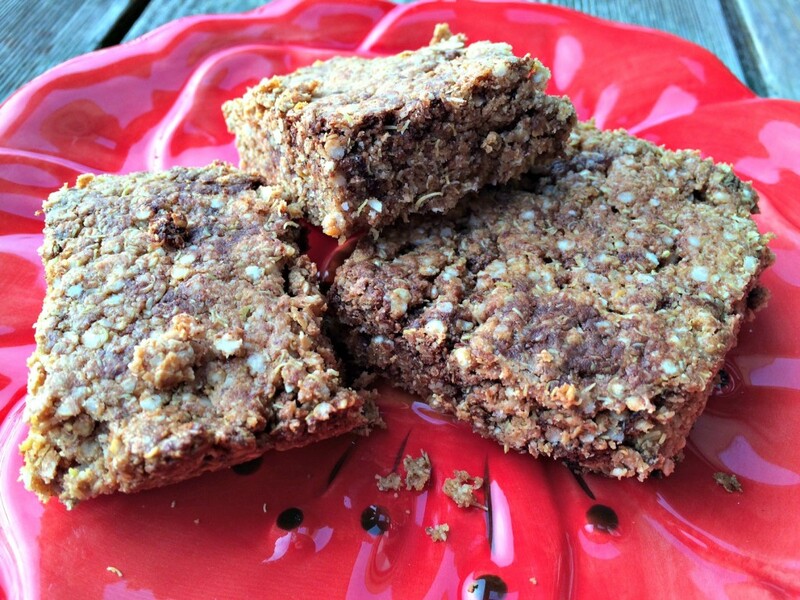 These are super yummy and I love the nutty taste combined with the chocolate! I love quinoa, but have never tried the flakes. I should try these, I bet my kids would love them too. My kids love them especially with the hint of chocolate from the chocolate chips! Enjoy! Happy, Green and Natural Party Blog Hop. I’m pinning and sharing! These do look good! I bet you could throw in whatever you like, too, like dried cranberries. yum! never tried something like this but it sounds awesome! Took me a long time to get used to quinoa. Never thought it could be applied to anything dessert-ish. Interesting recipe.